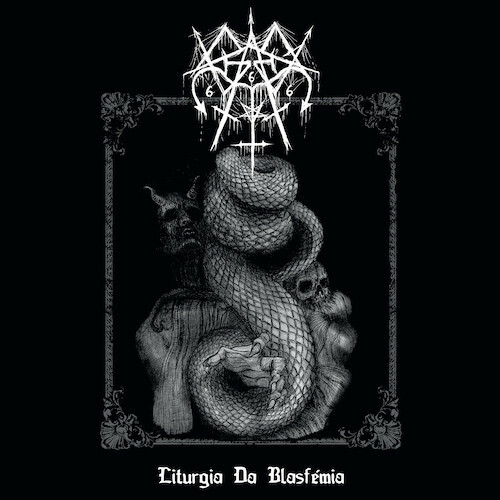 There’s a coiled serpent on the cover of Graves‘ new album Liturgia da Blasfemia, but these Portuguese black metallers have harnessed a lot of powerful demon horses in their hard-charging sounds, as well as demonstrating fanged striking power and loosing currents of reptilian venom. But this is an album that’s also more nuanced than you might expect. It conveys moods of wrenching misery as well as extravagant ferocity, and as pitch-black as the music usually is, it also includes moments that channel heart-breaking loss and heart-swelling incandescence. To put it differently, death and desolation loom over the album like the great heartless reaper of souls we have imagined for millennia, but notwithstanding that ever-present shadow, the album is very much a dynamic experience. All the changing moods, and the expert way in which the band ring those changes through memorable riffs, are a big reason why the album is well worth listening to from beginning to end — which is exactly what we’re making it possible for you to do today, just a few days before its February 1 release by Iron Bonehead Productions. 2. “I am Fire I am Death”: Here, the band begin to push you into the nightmare world in which much of the album dwells. Methodically pummeling and blasting drums undergird a roiling, mind-warping riff (with toxicity in the tone) that itself sounds warped and mutilated, a manifestation of misery and cruel madness, laced with sorcerous serpentine leads and demented shrieking and roaring (I did warn you about the vocals, but you still haven’t experienced the full array of vocal terrors). 3. “Sangrando em Golgota”: Extravagant cries accompany a new height of frenzy, yet the flesh-flensing guitars carry a melody that still seems implacably bleak despite the sensations of sadistic lunacy, and when the pace slows to a lurching gait, the atmosphere becomes even more oppressive and devoid of hope. 4. “Sangrando em Golgota… parte 2”: As the second part of the sequence that begins in the preceding track, this one is a morbid crawl, steeped in horror and coated in congealing blood, laced with terrifying distorted vocals and spikes of esoteric melody. It becomes a rushing surge that transmits feelings of devastating agony and a feverish yearning for mercy. When it slows again, and the voices rise up in a nightmarish cacophony, the song sounds like a dirge for the end of the world. 5. 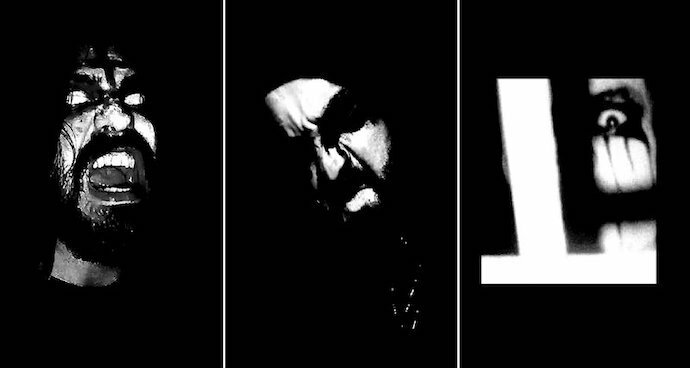 “Impregnado p` la Foice”: A slow and grieving intro segues into a brazenly hellish assault — still desolate and disconsolate, but deeply disconcerting in the chaos that’s given free rein through the riffing and the madness of the voices. In the midst of this rampage, the band slow into a more stately and somber march, but the shattering cries still seem shorn of even remnants of sanity. 7. “Minha Alma imolei em Golgota”: A mid-paced, stalking rhythm provides the head-moving drive for the moody maneuvering of the heart-tugging strings (and the usual lung-rupturing cries and goblin snarls in the vocal department ). There’s a forlorn wistfulness in the melody this time, the sound of once-bright memories becoming only embers and bitter ash. The pairing of this song with the one before makes for probably the most moving passage on the album. 8. “Graves Hold Your Name”: What a contrast to the last track this one brings. It’s another blazing fire-ball of sound, with an especially incandescent guitar lead, flying like a darting bird of flame that causes the heart to swell (rather than to break, as it feels like doing elsewhere on this album), rapturous in the vision of that creature’s blazing freedom. Of course, by now it probably won’t surprise you to learn that the song is also edged with a sense of foreboding (this bird will soon plummet — a grave holds its name, just as one does for you). 9. “Via Dolorosa até Golgota”: Here we are at the end, and what the end holds is a slow and shattering piece of suffocation and misery, though the music soon disappears, to be replaced by the other bookend of this album — a reprise of the same grotesque spoken-word sequence with which the album began. Well, if you’re still here rather than having skipped ahead, I’ll now leave you to the music, perhaps more intrigued by what you’ve read than bored out of your mind and anxious to get to listening. Either way, I hope you enjoy what this Portuguese trio have achieved as much as I have. Check the links below come February 1st, and you’ll find out how to get this fine album. Their 2018 demo almost made my year end list, so I’m pumped for this album! I missed that demo but this album is damned good.